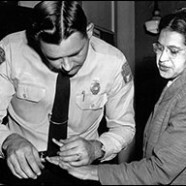 Rosa Parks was arrested on December 1, 1955 for refusing to give up her bus seat to a white passenger. Her actions were seen by many as starting point in the civil rights era. Her actions brought about the Birmingham Bus Boycotts in which Blacks demonstrated their defiance and eventually forced the desegregation of the bus lines. Parks would continue being involved in the civil rights movement for the rest of her life.